Arianespace orbited two key telecommunications payloads for Australia and India on the 74th consecutive success for its heavy-lift Ariane 5 – confirming this workhorse vehicle’s role as the launch services industry reference in availability, reliability and performance. Conducted from the Spaceport in French Guiana, the daytime mission delivered an estimated payload lift performance of 10,660 kg. to geostationary transfer orbit. It carried Sky Muster II for Australian operator nbn, and GSAT-18, which will be utilized by the Indian Space Research Organisation (ISRO). Ariane 5 begins its ascent from the Spaceport in French Guiana, carrying the Sky Muster II and GSAT-18 satellites for deployment in geostationary transfer orbit on today’s mission. Sky Muster II was deployed first in the flight sequence, separating from Ariane 5 at 28 minutes after liftoff, followed four minutes later by GSAT-18. Arianespace Chairman and CEO Stéphane Israël offered his congratulations to both customers – and everyone else involved with the successful mission – during post-launch comments from the Spaceport’s Jupiter control room. The Ariane 5 for Flight VA231 is shown ready for its daytime liftoff. 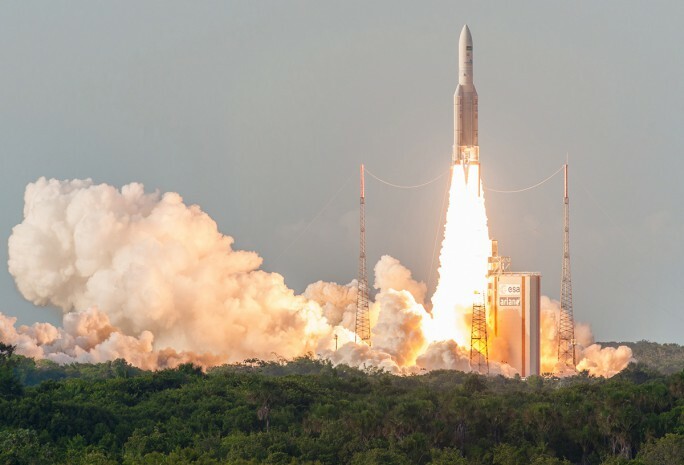 Sky Muster II is the second satellite entrusted to Arianespace by nbn (following Sky Muster I, which was orbited in 2015 on an Ariane 5), as well as the eighth payload to be launched by the company for Australia. Reflecting the country’s political commitment to bridging the digital divide, particularly in rural and isolated regions, Sky Muster II will help extend high-speed internet across Australia, including the Norfolk, Christmas, Macquarie and Cocos islands. It carries Ka-band transponders and will operate from an orbital position of 135 to 150 deg. East. The launch of Sky Muster II also continues a productive partnership between Arianespace and the satellite’s prime contractor, SSL (Space Systems Loral) – marking the 59th SSL-built payload to be lofted on an Arianespace mission. Highlighting another “long-term relationship,” GSAT-18 was the 20th satellite orbited by Arianespace for the Indian Space Research Organisation. This cooperation extends back to 1981 with launch of the APPLE experimental satellite, and further underscores the strong collaboration France and India have set up in space. Overall, Arianespace has won 86 percent of all geostationary launch contracts the country has opened to non-Indian launch systems – including those for GSAT-11 and GSAT-17, to be lofted on future missions from the Spaceport in French Guiana. – Perigee: 250.2 km. for a target of 250.0 km. – Apogee: 35,965 km. for a target of 35,957 km. – Inclination: 6.01 deg. for a target of 6.00 deg. Flight VA231 was Arianespace’s eighth of 11 launches targeted in 2016, and follows other heavy-lift Ariane 5 missions performed this year on January 27 (carrying Intelsat 29e as a dedicated single payload), March 9 (EUTELSAT 65 West A), June 18 (EchoStar XVIII and BRIsat) and August 24 (Intelsat 33e and Intelsat 36). Also conducted earlier in 2016 were medium-lift Soyuz missions on April 25 (with Sentinel-1B as the primary passenger) and May 24 (two Galileo constellation satellites); plus the September 15 light-lift Vega flight with a cluster of four SkySat satellites for U.S.-based operator Terra Bella and the Peruvian PerúSAT-1 spacecraft. Arianespace’s next mission is scheduled for November 17, when Ariane 5 will perform its first flight at the service of Europe’s Galileo navigation system – launching a quartet of Full Operational Capability (FOC) satellites.